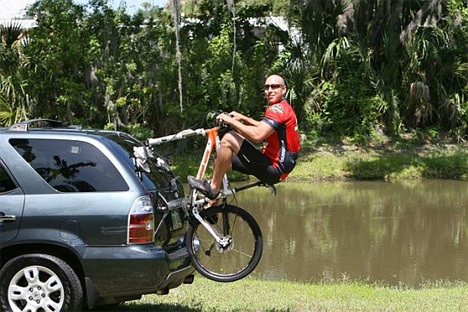 Biking is one of the healthiest hobbies out there, but it can be murder on your car. Transporting your cycle to and from the trail usually results in more than a few scratches from the bike carrier and from the bike itself. 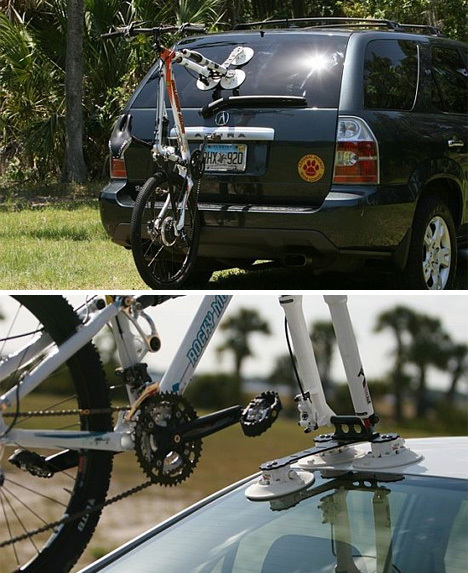 A new type of bike transport system from a company called SeaSucker keeps your car in pristine shape (well, as pristine as it was, anyway) while holding your bike securely with nothing more than a few rubber vacuum cups. The distinction between suction cups and vacuum cups is an important one. Suction cups tend to pop off of whatever they are supposed to be attached to – and at the most inopportune times, usually. Vacuum cups are much stronger – strong enough that they are often used in crazy “human spider” contraptions to take people up vertical surfaces. If the above picture is any indication, SeaSucker’s vacuum cups are pretty darn strong. Attaching a bike to your car with the SeaSucker system requires wetting down the vacuum cups and sticking them to a smooth surface, then smooshing the pump button down to create some powerful sucking action between the cup and your car. To take it off, you lift up on a tab. That sounds much nicer than dealing with the endless straps and clips of the standard bike rack. 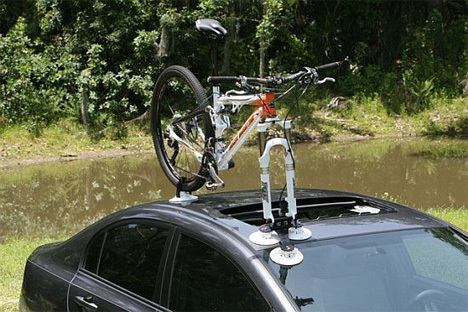 The racks are available in several different configurations for different types of cars and can hold from one to three bikes. See more in Bikes & Cycles or under Transportation. November, 2010.